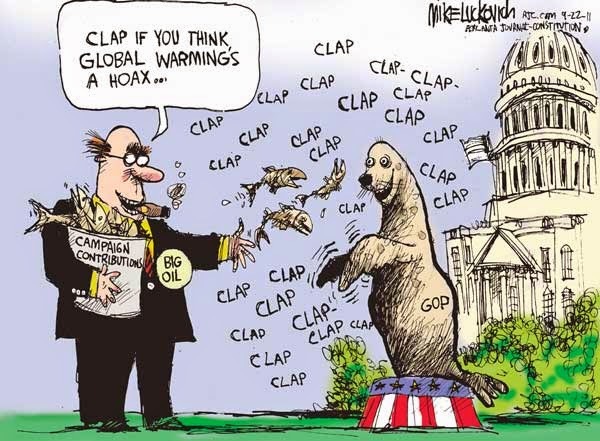 Unfortunately, despite all our scientific advances and supposed advances in rationality, there is still one lingering and debated issue...whether climate change is anthropogenic or not. If you’re a person who enjoys the Kochs or believes everything the CATO Institute tells you, this is directed towards you. In 2013 a study was completed by and authored by nine different scientists ranging from climate scientists at the University of Queensland to geological scientists at Memorial University of Newfoundland. The article, titled, “Quantifying the consensus on anthropogenic global warming in the scientiﬁc literature”, apart from being one of the best articles on climate science I have ever seen, without a doubt proves the human influence on the environment. Specifically, the authors, Cook et al., took over 10,000 peer-reviewed scientific articles published in journals examining climate science over the past 20 years and found that “papers rejecting the consensus on AGW…[make up]…a vanishingly small proportion of the published research” (Cook et al.). Specifically, the study found that literally less than 1% of all the papers published and studied rejected the anthropogenic thesis. When one churns the math (.007 * 11,944 papers = 83.6, rounded to 84), 84 out of the over 10,000 papers rejected the thesis that climate change is anthropogenic and, as per the study, that already amazingly small percentage is shrinking (Cook et al.). Now, Cook et al. 's article cites the fact that there has been an increasing number of papers that take no stance. This, while troubling, is easily explainable. Research needs to be funded and universities aren’t made of money and very vulnerable to lobbyists. Specifically, the oil lobbies have a huge influence. What’s huge? Well, in 2013 alone, lobbies spent over $100 million (OS). That’s a ton and can make a huge impact on what gets researched or published. Here, a “smart” climate denier will be quick to say “but wait, CO2 isn’t actually a greenhouse gas and CO2 doesn’t contribute to climate change!”. However, that is patently false. Although technically not the largest greenhouse gas, multiple studies prove that CO2 is the most important. Specifically, a recent study by NASA’s Goddard Institute for Space Studies found that although CO2 only accounts for 20% of the greenhouse effect, there is a large amount of CO2 that is not condensed and ultimate leads accounts for about 80% of the greenhouse affect (Lacis et al.). But, as John Cook says on his site Skeptical Science, “CO2 may be one of the most misunderstood subjects in climate science” and thus further elaboration and examination is needed. So let’s begin. The way temperature increases on the Earth work are very interesting. What happens is the sun bombards the Earth with radiation (ultraviolet, infrared, etc.) and this radiation is bounced off the Earth (via. the oceans and ice caps) and is absorbed by particles in the atmosphere and then re-emitted in all directions. Greenhouse gases (GHGs) are especially good at this because they absorb and re-emit thermal energy in the form of infrared radiation. Now the re-emission of thermal energy occurs in all directions, but for the most part, it is emitted back down towards the Earth and the process repeats. This overtime has a very real effect on the temperature of the Earth because the heat from the sun is literally trapped in the Earth’s atmosphere as if the atmosphere were the glass of a greenhouse. Measurements of the change in wavelength of light re-emitted shows that GHGs are especially good at re-emitting infrared light and studies on Earth show that the amount of infrared light (which is converted into thermal energy) coming back to the Earth is massive. This shows just how much energy is returning to Earth. We also know the climate sensitivity, that is how sensitive the Earth is to changes in radiation, and are thus able to compare the change in temperature over time vs. the change in CO2 emissions. This allows us to understand exactly what the affect CO2 has on temperature and, when plugging in the climate sensitivity values, changes in CO2, and temperature values, we find that “even under [the] ultra-conservative unrealistic low climate sensitivity scenario, the increase in atmospheric CO2 over the past 150 years would account for over half of the observed 0.8°C increase in surface temperature”(SS). 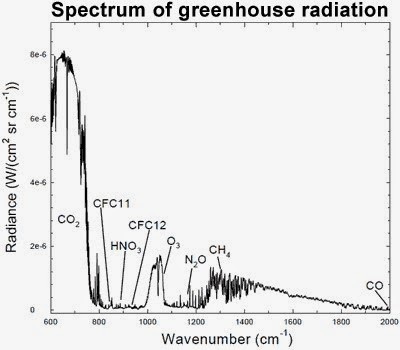 Thus, data from the IPCC as well as spectrographic readings of radiation and CO2 emissions conclusively show that CO2 causes warming. Finally, to cover all the bases that skeptics might try to steal, one lingering question remains and that is “how can humans be causing this if our CO2 output is so small?”. There are a few ways to explain this but the most obvious is the fact that humans are introducing excess CO2. The Earth is a fragile system and is well regulated naturally, but humans pumping CO2 into the atmosphere messes with that system and, over time, adds up. This is most clearly seen in the fact that 60% of human CO2 emissions remain in the atmosphere and have led to the highest atmospheric concentration of CO2 in over 15 million years (Tripati). So with that out of the way, a discussion of the impact of climate change on the Earth is going to be important. Climate change is a net bad thing for the entire environment for tons of reasons but most importantly for this paper will be the affect it has biodiversity and the survival of non-human species. There are a few main ways that climate change harms biodiversity, the first of which being something called ocean acidification. For most people, the threat of climate change is “oh, the Earth gets hotter” but that is far from the only impact. In fact, merely the release of CO2 causes tons of problems for marine life. Once CO2 is released, some of it is absorbed by plants, some stays in the atmosphere contributing to the greenhouse effect, and some gets dissolved into the oceans. This occurs much the same way oxygen gets into the water, but CO2 directly affects the acidity of water. Now on a small scale this would be fine, but on a large scale and over time, we see a downward trend in the pH of the oceans because more and more CO2 is getting dissolved. This drop in pH leads to the oceans being slightly more acidic in what scientists call “ocean acidification”. Ocean acidification isn’t some “oh, the water is slighty more sour” type of thing, rather it affects organisms at the bottom of the food chain and the impacts reverberate upwards. Specifically, the acidifying of the oceans leads to a decrease in coral growth, some types of snails that are crucial first level food sources are unable to construct their calcium shells and thus die before being a food source, and ultimately sensitive fish like salmon die as well (Romm). This is a net bad thing for biodiversity because species of fish that live amidst coral are deprived of protection and thus die off. Organisms that feed on the small snails (called sea butterflies) are unable to eat because their food source, the sea butterflies, are dying (Whitty). And obviously, organisms that depend on salmon and the habitats they create will die. What’s worse, we don’t fully understand the complex relationships of oceanic organisms and thus far too often, our predictions of “it won’t be that bad” are dead wrong. By continuing to pour CO2 into the atmosphere, subsequently acidifying the oceans, we are quite literally playing Russian Roulette with nature (Hendriks et al.). But I wish that were all. Climate change has drastic implications for creatures living on land as well. Specifically, as the Earth warms, diseases mutate and grow more easily and we see an increase in the number of new diseases that are killing off animals and plants currently (Schnackenberg). And at risk of sounding like an alarmist, although the threat is very real, there is one other implication and that is habitat destruction. As the temperature increases and water becomes more acidic, increased pressures are placed on animals in their habitats and those with already fragile ecosystems due to human intrusion will suffer the most. Scientists predict that with the loss of one species, another will go, and another, and another in a cascade effect. This will be detrimental obviously not only to human life, but to all life because organisms will no longer have food or a place to survive (Hansen). So please, for the sake of not only your children or whatever petty reasons you have, but for the sake of the Earth, recognize that climate change is real and human caused and we riding in the car headed off the cliff. Robert Way, Peter Jacobs, and Andrew Skuce. 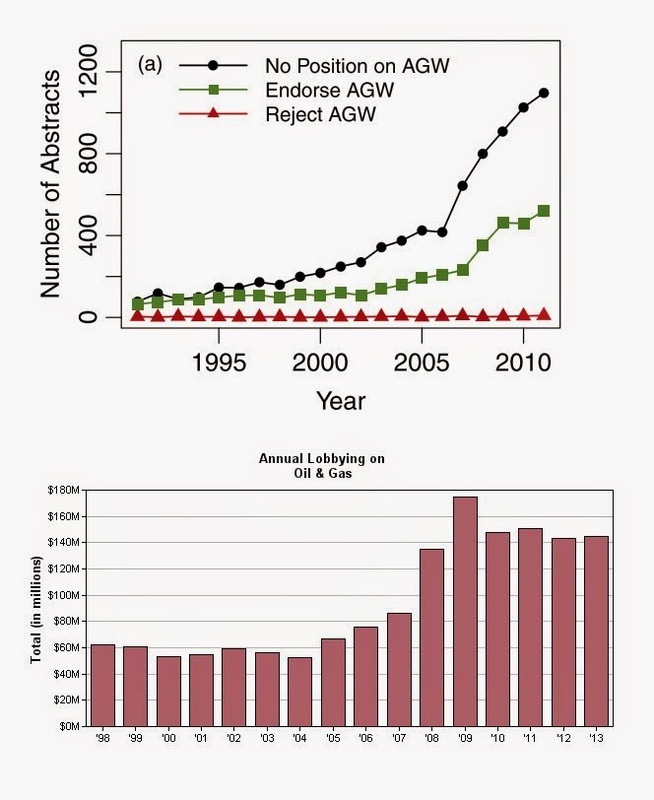 "Quantifying the consensus on anthropogenic global warming in the scientiﬁc literature." Environmental Research Letters Online (2013): n. pag. iopScience. Web. 19 Feb. 2013. FORCING OF CLIMATE." NOAA. N.p., n.d. Web. 3 Apr. 2014. Hansen, James . "Tipping Point." Columbia. N.p., n.d. Web. 3 Apr. 2014.
acidification: A meta-analysis." Estuarine, Coastal and Shelf Science 86.2 (2010): 157-164. Web. IPCC. "8.6.2.3 What Explains the Current Spread in Models' Climate Sensitivity Estimates?." 8.6.2.3 What Explains the Current Spread in Models' Climate Sensitivity Estimates?. N.p., n.d. Web. 3 Apr. 2014. Percent." Motherboard. N.p., 11 Apr. 2014. Web. 22 Apr. 2014. Control Knob Governing Earth's Temperature." Science 330.6002 (2010): 356-359. Science Mag. Web. 3 Apr. 2014. (1998): 2715-2718. University of Oslo (I think, it's in Norwegian). Web. 3 Apr. 2014. OS. "Oil & Gas." Opensecrets RSS. N.p., n.d. Web. 23 Apr. 2014. Romm, Joe. "Science: Ocean Acidifying So Fast It Threatens Humanity's Ability to Feed Itself." Earth Law Center . N.p., n.d. Web. 3 Apr. 2014. Schnackenberg, Kristen. "Global warming may intensify disease." Yale Daily News. N.p., n.d.
Major Climate Transitions of the Last 20 Million Years." Science 326.5958 (2009): 1394-1397. Web. ­Whitty, Julia. "Snails Are Dissolving in Acidic Ocean Waters." Mother Jones. N.p., 27 Nov.
2012. Web. 3 Apr. 2014. I will put the equations down here to save space: CO2’s radiative forcing, dF, is found using “dF = 5.35 ln(C/C0)” where C is the current concentration of CO2 and C0 is a reference concentration (pre-industrial concentration of 280 ppm) (Myhre). The climate sensitivity (dT) equation is dT=λ*dF where λ is climate sensitivity in °C/W/m2 (SS). We then know that a doubling of CO2 can lead to increase in temperate of 2-4.5°C (IPCC). Using this, we can solve for λ: λ = dT/dF = dT/(5.35 * ln)= [2 to 4.5°C]/3.7 = 0.54 to 1.2°C/(W/m2) and from there, we can calculate temperature changes (SS). Specifically, using data from 2010 and the first equation, we get dF shown here: dT = λ * 5.35 * ln(390/280) = 1.8 * λ (SS). Using skeptics own numbers, that is their assertion that the climate sensitive value is around 0.27°C/(W/m2) we can calculate the change in temperature and we get the conclusion I wrote above: dT = 1.8 * λ = 1.8 * 0.27 = 0.5°C (SS).